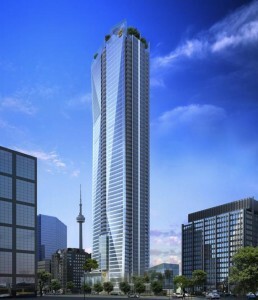 Bordering the Entertainment and Financial Districts at 180 University Ave, this 873,000 sq ft Condo/Hotel will offer the convenience and vibrancy of urban living with the legendary services of a 5 star Shangri-La Hotel. The two storey glass atrium and podium will be a focal point on University Avenue across the street from the new Opera House. Shangri-La Toronto is a 66 storey tower (360 residential suites (202 hotel suites) being developed by Westbank Projects, the Petereson Investment Group, and Shagri-La Hotels and Resorts, and designed by architects James K M Cheng and Hariri Pontarini. The first 17 floors will consist of luxurious hotel rooms, floors 18-49 will be 287 residences, and floors 50-66 will be private estates (including 2 penthouses). The Shangri-La story began in 1971 with their first deluxe hotel in Singapore. Inspired by the land in the legendary novel Lost Horizon, by James Hilton in 1933. The name Shangri-La represents the service and serenity provided by this renowned worldwide hotel chain. Currently based in Hong Kong, Shangri-La is Asia Pacific’s leading luxury hotel group, and the world’s finest hotel ownership and management companies. The Shangri-La group has 72 hotels and resorts (with a room inventory of over 30,000) in Asia Pacific, North America, Europe and the Middle East. In addition new hotels are under development in China, India, United Kingdom, Turkey, Philippines and Qatar. Suites range in size from 800 sq ft to the 6700 sq ft penthouse suite (with a 2900 sq ft terrace). Four new 2 storey penthouse units have just been released. They will be located on the 65th and 66th floors, and will be between 3300 – 3500 sq ft. Each suite will have its own private elevator service, and a 1400 sq ft terrace (featuring a hut tub). These penthouse units will be the highest terraced condos in Toronto. These penthouse suites are priced over $9 million. >>Click here to contact me if you are interested in this project, or any other condo or loft development in Toronto.